Join us in the Aromaleigh Imaginarium- a private Facebook group for all things Aromaleigh! A private customer group to discuss all things Aromaleigh! Share your reviews or looks. Ask for advice about application or finding the perfect shade. Discuss new collections or the monthly Ephemera subscription box. A new round of 25% off weekly sales was published yesterday. Yup, just as nerds have quietly begun to infect other more “normal” hobbies with our favorite things (Like knitting? Make a Doctor Who scarf! Like sports? Sign up for a Quidditch league! ), so too has the makeup world opened up and made room for those of us who want our eyelids to be the same blue as the TARDIS. But when it comes to indie creators, the process involves more than just slapping a reference onto a tin of eyeshadow. The women who run these companies truly care about the stories and characters which inspire their work—and now that the female arm of the nerd community is no longer satisfied with badly-fitted t-shirts from the men’s departments, they’re happy to oblige our demand for more. CLICK FOR THE WHOLE ARTICLE! Our new website is up and running perfectly! Point your browsers towards www.aromaleighcosmetics.com! Create an account and review your favorite products to earn points towards discounts on future orders! You can create an account directly, or use your Twitter, Facebook, Google+ or Amazon accounts. The Points system allows you to earn points to use towards discounts on future orders. You earn 1 point for each dollar you spend, 10 points for creating your account, and 5 points for each eligible product review. 50 points = $1 off when you shop! You can now create multiple wishlists! These wishlists can be set as private, public or shared. Order History – once you’ve placed an order on our new website, your order appears on your account page. New Autumn 2014 Collection – DRYADES is on this week’s 25% off weekly sale! Autumn 2014 welcomes the DRYADES collection at Aromaleigh… ten dramatic duochrome shades imbued with the tones of Fall’s splendor. Dryads and Hamadryads were the Greek nymphs of the forests and trees. These colors were all inspired by specific Dryads or groups of Dryads, and incredible classic paintings portraying them. We’ve been getting some amazing feedback on this collection! Here’s the first review, from Glitter Bomb: “Thumbs way up on this one. Definitely check it out, especially if you’re a fan of earthy colors. I really liked everything, and more than half of them made it onto my “must-haves” list, so you know I’m a fan! Anything that isn’t there is filed under “we’ll see how it looks when I actually wear it”. (All swatches done dry, on bare skin. )” Click through for swatches and the full review! The 50% off product clearance continues: CLICK HERE FOR OUR CLEARANCE SITE! 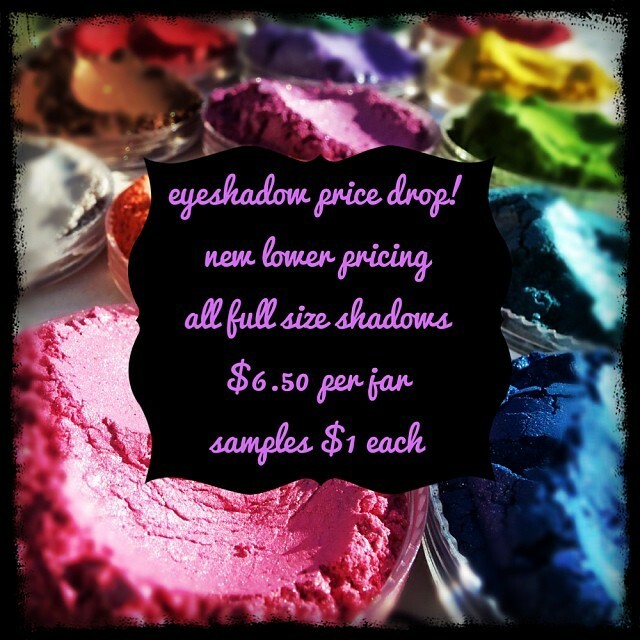 Eyeshadows just $3.25 for full sizes and .50 cents for samples! We can combine orders from the clearance site and the new site to save you on shipping- full details can be found on the home page of the clearance site. There is no order minimum on the clearance site. Two of the most popular eyeshadow collections on the clearance site are Bete Noire and Alchemie. Indie Know blog recently reviewed the complete Bete Noire collection and provided some amazing skin swatches- if you haven’t seen these, they will make you run to the clearance site and scoop up some of these colors before they’re gone! (A sneak peek of some of their swatches is below the links, but you’ll want to click through to the reviews to see them in their full splendor!) Just ready to shop? SHOP BETE NOIRE! Bete Noire Collection Overview and Swatches Part 1! Our ALCHEMIE line of shadows is also on 50% off clearance for just 3.25/full size and .50/sample. (SHOP HERE) These are rich, metallic finishes. The inventory on some of these colors is getting very low. So if you’ve been on the fence about this collection, now is the time to act. Some shades are already sold out. If you need some convincing, check out these gorgeous swatches and review from Baroque in Babylon, one of our favorite beauty blogs! CLICK HERE FOR REVIEW! “DIAVOLI”, eyeshadows inspired by Dante’s Inferno… now available! Aromaleigh Halloween 2014 presents the “DIAVOLI” collection. Diavoli translates to devil in Italian, and this collection is inspired by the devilish demons of Dante Alighieri’s Inferno. There’s 13 colors inspired by the Malebranche of the 8th circle of Hell, which in italian is called “Malebolge”, which translates to “evil ditches”. The Malebranche (which means “evil claws”) were 13 devilish demons who patrolled the 5th Bolgia. (only 12 are named in the Inferno). Bolgia 5 was where extortionists, blackmailers, politicians and unscrupulous businessmen: sinners who used their positions in life to gain personal wealth or other advantages for themselves) are punished by being thrown into a river of boiling tar. Should they try to escape, the Malebranche, armed with grappling hooks and barbs, stand guard over them. Visual inspiration comes from my own reader’s eye, as well as illustrations and paintings by Gustav Doré, Sandro Botticelli, Giovanni di Paolo and Giovanni Stradano. The shades in this collection all feature a plush matte base with strong color-traveling duochrome/multichrome pigments. You can experience this color traveling effect by altering the angle of light as it reflects off your eyeshadow. The easiest way to do this is to move your jar/swatched skin underneath a direct light source, such as a desk lamp. As you move it, you’ll see the color switch from one to another. The effect is very dramatic in some shades. We tend to agree, here’s a few of our favorites from that collection- at full size so you can see the gorgeous and intense color-traveling shifts! This year’s holiday collection will be very exclusive, using super-duper luxe, sparkly color-traveling multichromatic pigments. This will be the first collection ever using these uber pigments, which we’re extremely excited about. If you’re enjoying Dryades and Diavoli, these will blow your mind, as they’ll have the same awesome chameleon effects, but with much more sparkle. There will be very limited numbers of sample sets, full size (with custom gift packaging), and individual full sizes available. The theme of this year’s holiday collection will be… SATURNALIA! With my current obsession with ancient history (and my Italian ancestry), I’m taking this year’s theme to heart. 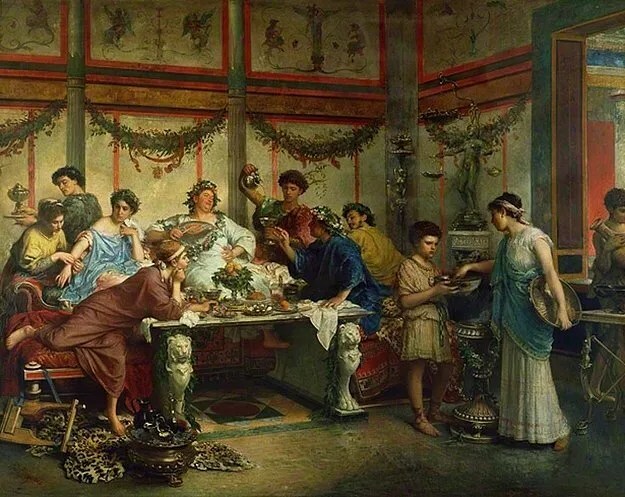 We’ll be doing a week-long Saturnalia inspired celebration in our household, complete with recreating ancient Roman recipes, reviving some of the Saturnalia customs, and decorating our tree in honor of the solar celebration, with holly branches, a giant sun tree topper, and the colors of blue and gold. I’ve been researching this ancient festival for the last few weeks, and seeing that I tend to take my collection themes quite seriously, I can’t wait to celebrate this year’s winter solstice this way. COLOR OF THE MONTH suggestion thread is open on Facebook:It’s time to start discussing July’s color of the month! Share as many suggestions as you like- color name + description. Past colors of the month have often related to something which occurred during that month, such as this month’s “Fateful Storm” in honor of D-Day, and “Mater Matuta” in reference to June’s ancient Roman Matralia festival (scroll through to the end of this wrap-up and you’ll see them!). But your suggestions can relate to anything at all, whether it’s popular culture, history, science or just your own dream color idea! We’ll tally up your suggestions and create a voting poll around the 20th of the month. If your color is chosen as the winner, you’ll receive a full size jar! ADD YOUR IDEA! The SERPENS collection has a beautiful new satin metallic duochrome shade this week- UKTENA. Check out the entire collection, HERE. UKTENA is a rich warm satin green with a strong gold metallic duochrome effect. In case you missed it, here is last week’s color: JÖRMUNGANDR! Every Sunday, we will be hosting a fun giveaway on FACEBOOK! Last Sunday, we gave away 4 full sized eyeshadows. Last week’s question was: “What does your holy grail blush or rouge color look like?” Here’s what last week’s event looked like. There were many great suggestions in this comment thread for blush colors and formulas. What we never realized was that so many people seem to prefer a matte formula! There are two new lines of blush/cheek colors in the works and they’ll incorporate many of your suggestions! One will be themed after Antique/Heirloom/Vintage roses, and the other will be Ignis Antiquita cheek colors- continuing the theme of history’s forgotten women. Congratulations to Heather Funk, she won four full size eyeshadows and will be receiving them in her mailbox soon! Hundreds of items added to our Clearance page! New creative path, new products on the way! Check out Kristen’s message about these changes, the new creative direction she will be taking Aromaleigh in, and information about our new website that is currently in the works,HERE. New weekly sale items are up! Since we have a large proportion of our current catalog on clearance right now, we will be offering fewer weekly sale items. The Monday deal will still occur as regularly scheduled. Check out the weekly sale items: HERE. Our Hannibal-Inspired collection, “THIS IS MY DESIGN” sees one new releases this week, for a new total of 25 shades. More colors are in the works! This collection may see a total of 26-30 colors at completion. Check out this write-up about the collection at PAPER DROIDS! This week’s color is a beautiful veil of aqua iridescence, inspired by some varied concepts as well as the show’s cinematography. You can check out photo inspiration and back story, HERE. Below, Check out these, and future TIMD color combinations from Cleolinda- she’s paired them up with the photo inspirations from the show. She’s also been doing amazing photo inspiration and creative conception back-story posts for each of the shades from THIS IS MY DESIGN, and we’ve linked to them on our site on each color’s individual page. She created this grid of the collection when it was at 20 shades, last week- we have it as our desktop wallpaper! Click through to see the big size file of this one, and check out all of Cleolinda’s posts tagged Aromaleigh. She does lots of skin swatches, and talks color combinations and application, too! Our winning shade for June color of the month was “FATEFUL STORM”, suggested by Zillah. It’s a deep steel gray satin base with navy tones, and a strong gold metallic duochrome shift. It also has some pale coppery microshimmer. This color is shifty, and you’ll get drastic different effects by applying it dry, over primer, or with a sealant. Our swatch photos are over a very light layer of primer, with the color patted on. It appears more gray/blue dry, and when applied over primer, the gold duochrome shifts it into green tones sometimes! It was suggested by Zillah during our monthly suggestion thread. The color is in honor of the June 6th D-Day Invasion, in which weather played a crucial factor. Thanks everyone for participating in our monthly thread, this is a gorgeous color and we hope you love it! Zillah, keep an eye on your mailbox for your full size jar of this great shade! We also went ahead and did a 2nd COTM, “Mater Matuta”! We’ve definitely had some Roman-themed colors this year, such as “Bona Dea”, “Et tu, Brute?” and “Janus Primus, Vesta Extrema”. This one is in that same concept. The color was originally suggested as a pale pink with gold shimmer, but we adapted it to reflect more of the deeper, pre-dawn colors of the rising sun. It’s a satin rose/buff base with a rosy metallic undertone and sparkles of copper and rose. May 23rd weekly wrap-up: New releases, Sales, Discontinues, Last day to vote for COTM! A lot of great things to update this week! With all of the activity lately, we’re going to be doing weekly wrap-up posts so that you can easily access it all in one place. First, please make sure you cast your votes in the Monthly Special Edition Color Polls- today is the last day to vote! VOTE HERE! Then, join us on FACEBOOK! Every Sunday, we will be hosting a fun giveaway. Last Sunday, we gave away 4 full sized eyeshadows. Here’s what last week’s event looked like. It’s fun to read through everyone’s favorite products and colors, isn’t it? Next up, product clearance and discontinues: Hundreds of items added to our Clearance page! New creative path, new products on the way! Some new weekly sale items went up yesterday! Since we have a large proportion of our current catalog on clearance right now, we will be offering fewer weekly sale items. The Monday deal will still occur as regularly scheduled. Check out the weekly sale items: HERE. The SERPENS collection is on 25% off sale this week, and this week’s new shade is a gorgeous soft coral/pink called SHIMCHONG. Check out the entire collection, HERE. Did you miss last week’s shade? It was TARASQUE, shown here next to it’s visual inspiration, a gorgeous painting of St. Martha and the Tarasque. Our Hannibal-Inspired collection, “THIS IS MY DESIGN” sees two new releases this week, for a new total of 22 shades. More colors are in the works! This collection may see a total of 26-30 colors at completion. Check out this write-up about the collection at PAPER DROIDS! Cleolinda has been doing amazing photo inspiration and creative conception back-story posts for each of the shades from THIS IS MY DESIGN. She created this grid of the collection when it was at 20 shades, last week- we have it as our desktop wallpaper! We have just added a considerable number of products to the DISCONTINUED section. We’ve been considering these changes for a while, and our May 1st corporate changes sealed the deal. Most importantly, Aromaleigh is not going out of business! The majority of the discontinued products are Aromaleigh v1 product/dupes that were made available because we did not have the budgeting available for completely new concepts, formulations and creative work. The products here are marked down, and available while quantities last. As of 5/17, we have jar/sample inventory on the shelves, as well as larger jarred batches in back. We estimate that these products will remain available for the next few months. of course if there is high order volume for these discontinued products, we’ll communicate that you you. ABOUT THE DISCONTINUATIONS – New products, new creative paths! 50% OFF CLEARANCE! – Love is in the Air… Limited Edition Eyeshadows – Starting to sell out! New Pure Eyes Matte Skin Swatches! We photographed these about 10 days ago and have been working on getting them arranged into grids for you. This is the first time Aromaleigh has skin swatched the mattes. These swatches are on bare skin- no primer was used. (The sharp line is created by using a piece of tape to mask off the area). We didn’t use primer because primer can darken the color of mattes. New reduced pricing on all eyeshadows! Full sizes are packed with sifters in the standard “5 gram jar”. This doesn’t mean the jar contains 5 grams of eyeshadow, but rather pertains to what this jar size is commonly known as. We mark the weight of all of our eyeshadows are weighing 1.2 grams net weight. This is a lowest possible weight- most colors will weigh much more. We made the decision to give all colors a lowest possible weight indication because every color weighs a different amount due to varied pigment particle sizes. We use the “5 gram jar” which is the standard size that the majority of the indie cosmetic companies use. We pack each jar full and then insert the sifter. While we air on the side of caution in indicating the weight of our products, rest assured- you are getting just as much product from us as you are from other companies that indicate much higher weights on their “5 gram jars”. Samples are 1/8 teaspoon of “packed” eyeshadow (comparable to 1/4 tsp of “fluffed/shaken” eyeshadow– and are packed in small zip baggies and contain numerous applications. Depending on the application method which you use, you can expect anywhere from 10-20 uses or more, from an Aromaleigh eyeshadow sample.